It’s a well known fact that I LOVE Halloween. Ever since I was a child, I have never been one for plain old costumes and created ever more unique ensembles, ranging from Dracula with a puppet snake (made out of a pair of tights and worn like a sock puppet), road kill and Charlotte (a famous girl ghost of Warwickshire who was locked in the family tomb in the plague as they thought she was dead, only to re-open the tomb later to find her dead on the steps with her fingernails worn away from clawing at the entrance and chunks of her arm missing…presumably from hunger and madness). Last year I experimented with a 1920’s harlequin and sugar skull makeup and this year I have been given the opportunity to try and recreate Tim Burton’s fabulous Corpse Bride! I have longed to do this ever since watching the film, but finding the time and excuse has been difficult. With an aptly themed Birmingham Dr Sketchys on the way and a small Halloween get together, I think I may have found the excuse! Candee, Birmingham Dr Sketchys curator and my dear friend, donated a wedding dress for me to play around with. After trying it on to test the style, I carefully cut out the underskirts and set about cutting off the sleeves and bodice, so that I could re-attach with a more A-line look. The silk gave the gown a fabulous vintage feel from the offset, whilst the Venice lace around the edge helped give a ragged feel to the train. I dyed the bodice and skirt separately in a tin bath with China Blue Dylon dye, taking the bodice out after a few minutes as I wanted this paler. I started getting concerned that it was turning green but luckily it did eventually go pale blue! The Corpse Bride’s dress was actually white, but I loved how the dress took on a blue hue in the moonlight and shadows as it gave it more atmosphere. I played the movie again and again to get a feel of the train with its holes and jagged edges and to get the other small details right, such as the purple-blue edging. 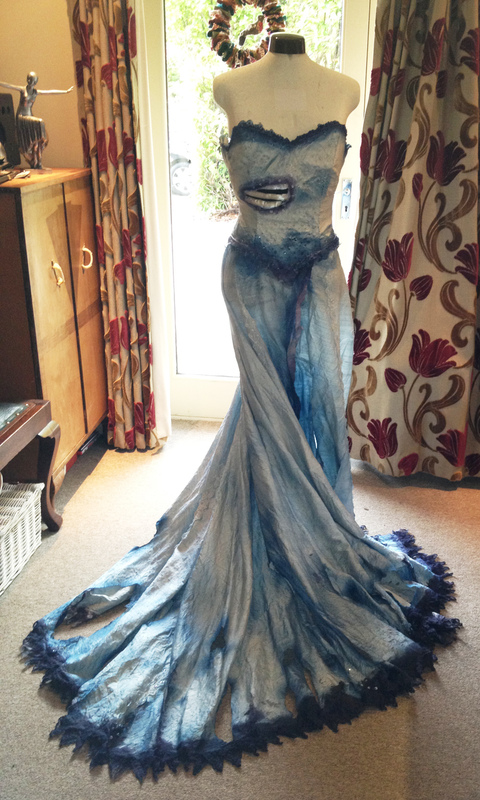 I managed this with some BMW Topaz Blue spray paint and hand painted over the top with blue and purple acrylics all the way around the train and bodice edges. I also added spray paint around the holes and tears to make them really stand out. Next came that hole, revealing the Bride’s ribs. After searching online for costumes and SFX latex body parts I decided to make my own simple version. I didn’t want gory or bloody and bits of flesh hanging off the bones. The beauty of Tim Burton is the clean lines and purity. Death was portrayed as the colourful happy place compared to ‘upstairs’ (Life), which was tinted with sepia and dull greys. I used high quality black velvet for the background as this fabric is perfect for absorbing the light, giving the illusion of a dark cavity. For the ribs I found some off-white ribbon sewed 2 lengths together to make a tube and stuffed it with polyester stuffing. I made 4 of these and then sewed them onto the black velvet with a slight curve to make the effect of ribs. 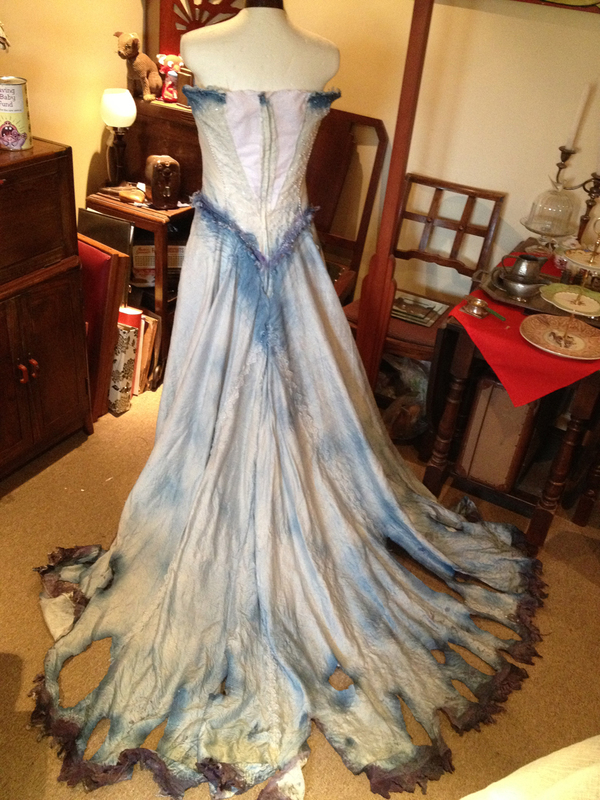 This was then glued to the inside of the bodice and left to dry whilst I danced around the room with excitement. 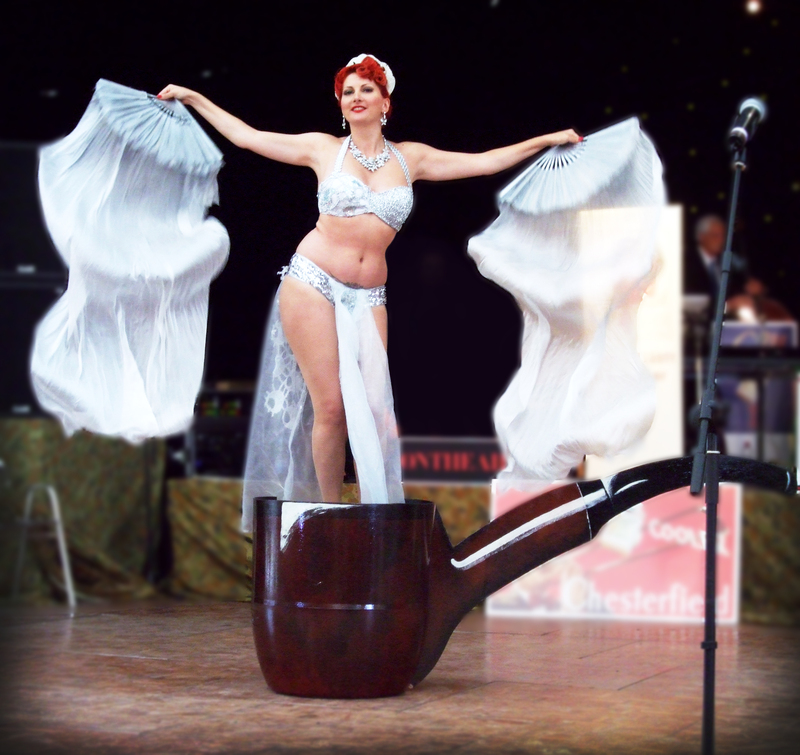 This weekend I managed to complete the headdress and veil! 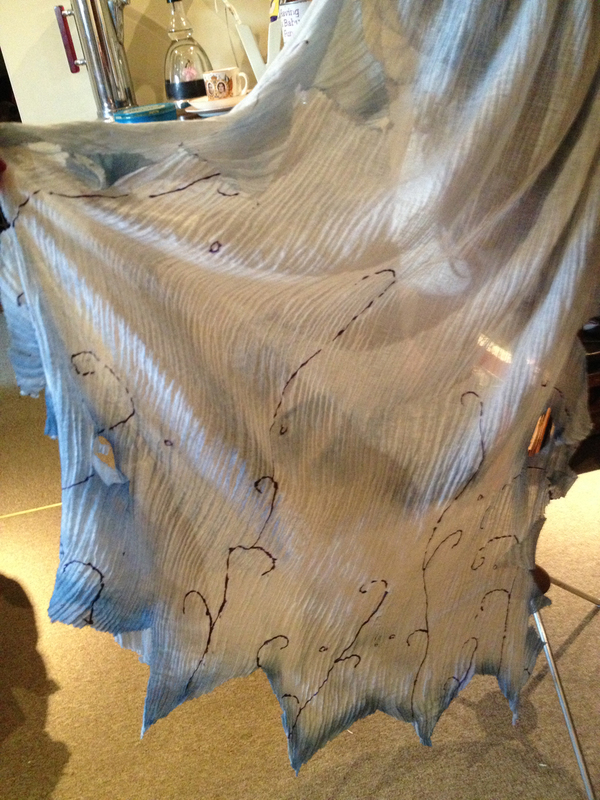 The veil in the animation is made from Muslin, which has a good tatty feel to it. I happened to have some spare and kept it off white, whilst cutting jagged edges and spraying them with the car paint. In some parts of the movie, you can see swirly vine detailing on the veil. It is sometimes portrayed in grey and others in purple, so I took the theatrical route and went the latter so it stood out. Next came the headdress. I had bought a long wig from Ebay which ended up being purple and not dark blue! It doesn’t look too bad, so sprayed a little paint on it to add some matting. 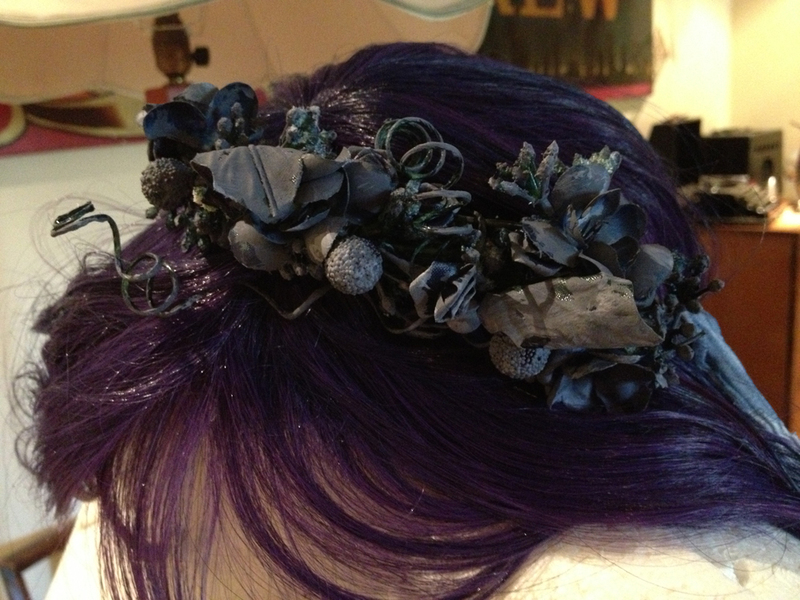 The headdress itself I made out of thin plastic corset boning wrapped with leaves, berries and flowers. There are more on one side than the other, which is true of the film too when you see the piano duet scene. I sprayed with the same blue paint and over-painted with grey acrylics. The veil was then attached to the back by folding over the top edge. Next the legs…The Corpse Bride has one skeleton leg with skin on her foot and ankle like a baggy blue sock, whilst her other leg is blue skin. This is easily done by cutting off 1 blue leg from your tights and attaching a skeleton print one in its place. You can then use the cut off blue leg to use as the baggy skin. Genius huh? The arm has been a little more difficult. I haven’t got the pennies to buy a prop skeleton arm (my first idea), so will be doctoring a skeleton print glove by adding more length and extra bone. This will then be sewn to the underarm of the bodice and held on the shoulder with some toupee tape if needed. I have the makeup ordered (light green for the base, then blue and white to blend with purple eye powder for shadows) and will post about this when I have tried it out! Enjoy the photos of my costume and I will get some shots IN the costume on Halloween! 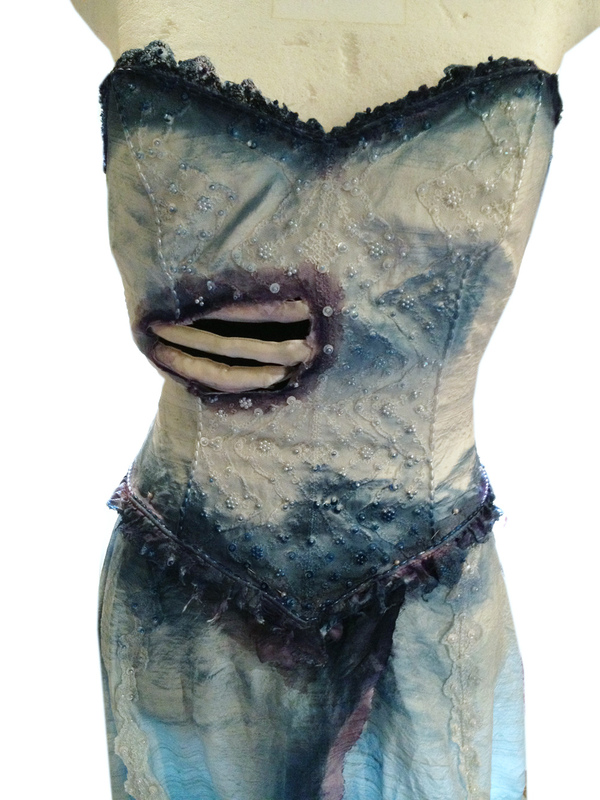 Posted in Arts and Crafts, Home and Leisure and tagged corpse bride costume, costume making, goth bride costume, halloween bride costume, halloween costume, halloween costumes, handmade halloween costumes, kitten von mew, the corpse bride, tim burtons corpse bride. Bookmark the permalink.